Brand New Retro founder, Brian “Doug” McMahon, has found a way to immortalise the best of Irish pop culture in print media. For the past five years, Brand New Retro has been the online home to thousands of digitised images, adverts and articles from vintage Irish publications dating back to the early 1950’s. 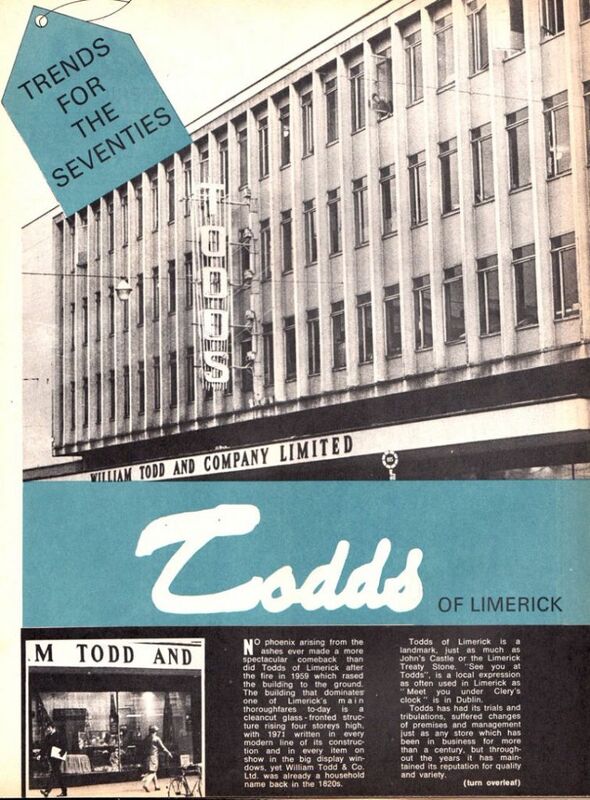 The website includes everything from images of Irish landmarks such as Desmond Castle in Adare being featured in Vogue magazine in 1959, to Todd’s of Limerick advertisements in 1971. Brian is now known for sourcing and scanning vintage magazines and fanzines that have never before been available online. Since 2011, the website Brand New Retro has become so popular that Brian recently released his own book turning the websites best retro finds into something brand new again. Teaming up with graphic designer Joe Collins, the Brand New Retro book was launched in November 2015 and has opened up many people to a whole new world of Irish pop culture. Why did you first decide to create Brand New Retro? I was involved in the punk and post‐punk music scene in Ireland and played in groups and produced fanzines. I thought the fanzines, photos, press reviews and demo tapes I was involved with were important and should be digitised so I thought about it but did nothing about it until my father died suddenly five years ago. I found a brilliant photo of him with my mother at Bulins, Mosney from 1964. I scanned it and this transformed it into something big and beautiful and I knew then that this was the beginning of the blog, using this scanned photo as the banner. How do you typically find magazines for the website? I had a great collection to start with. Having created fanzines back in the late 1970s with my brother Eamonn, we found that we developed a respect for the work that went into magazine production so we held onto a lot of what we bought and were less inclined to discard them.I’ve always enjoyed going to flea markets, jumble sales and car boot sales and I find it hard to walk past a charity shop. So I’ve picked up lots of good stuff from these sources over the past 40 years. Online and word of mouth also work well. How did the option to create a book first come about? It was always an ambition to do a book version of the blog and bring the best scans back to their former physical glory of print and have them all together in one book. The blog had become successful [and] traffic to the site grew. It had built up a reputation for posting interesting, rare content most of which never had appeared online. It won multiple blog and web awards and I knew that there would be interest and demand for a book version.My friend Joe Collins is a graphic designer and also works in advertising. In 2014 he updated his portfolio and produced it in book format. It was a very impressive portfolio as was the actual book itself. Joe was highly motivated, he shared my ambition to revitalise these lost images and present them in a beautiful, contemporary book format. We produced a mock-up of the book, fifty pages, and used this in our discussions with publishers. Independent publishers Liberties Press liked our idea and we liked them. How did you decide on the cover of the book? We wanted to get the physical magazines on the cover ‐ and for the front and back cover to look great but also to have significance. We rented the News Vending stand on O’Connell St, Dublin and at 6.00 am on a Sunday morning last April we filled the shelves with my old magazines and papers. What are some of your favourite articles and adverts from the book and why? I love every page in the book. Each has its own story that goes with it. You said that when you were younger you used to create fanzines ‐ what were they usually about? Yes, I started a fanzine called Too Late with my brother Eamonn. The first issue was in 1978. A further four issues were produced and sold around pubs and discos in Dundalk town. While the first issue was heavily influenced by punk fanzines, the content and design evolved over the years into offering a humorous and irrelevant look at life in Dundalk for the young single male and female during the late 70s and early 80s. Essentially, it was about music, TV, pubs, fashion, books, movies, discos and sport. It cost a fortune to produce and we didn’t have any sponsorship or adverts in it, the only revenue was from sales. Where do you think your interest in print journalism stems from? Both my parents were big newspaper and magazine readers and were big fans of sport and the arts. Also living close to the border we would pop up to Newry where you had a wider choice of comics and magazines and they were much cheaper than in the South. Also the DIY spirit of punk and seeing other fanzines come out inspired my brother and I to just go ahead and do things that we really cared about. Do you think that magazines are now becoming obsolete? Before the internet, magazines WERE the internet. There is less need and demand for them but they won’t become obsolete. What are your plans for the future with Brand New Retro? Continue to seek out and post more lost, rare interesting Irish pop culture content on www.brandnewretro.ie. The Brand New Retro book is available to purchase now in bookstores nationwide and on www.libertiespress.com. You can see more digitised Irish articles and ads on www.brandnewretro.ie.